Founded less than three years ago, Torrent9 swiftly became one of the most popular torrent indexes around. The site is most popular in French-speaking countries, which is the target audience. This includes France, but also Cameroon and Gabon, where it’s among the ten most-visited websites locally. With millions of weekly visitors, the site was doing rather well. However, for reasons that remain unexplained, Torrent9 disabled the option to download torrent files a few days ago. “Torrent9 will no longer offer downloads,” a message posted on the torrent site reads instead. Right above that, there’s a prominent banner encouraging visitors to use a VPN. Specifically, a “Torrent9” VPN which can help to prevent outsiders from monitoring their downloads. Update: After finishing the article the “Torrent9 will no longer offer downloads” message changed to a “maintenance” notice. The VPN advertisement was also removed. We adjusted the article to reflect this. This VPN recommendation caused some confusion, as many visitors assume that the download links will reappear when they connect through the VPN. However, that is not the case, TorrentFreak confirmed. 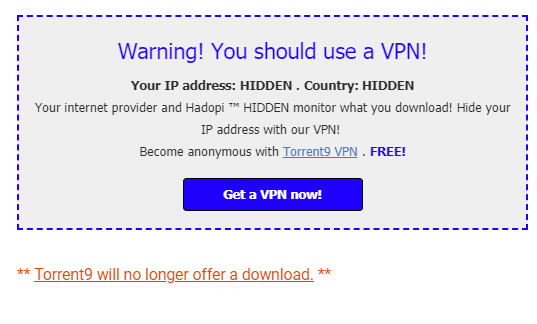 The advertisement no longer listed people’s IP-address when they were connected to the VPN, showing “hidden” instead, but the download option remained unavailable. It’s just an ad really. This is also corroborated by French news site Numerama, which quotes several users who experienced the same issue. The advertised VPN is Trust.Zone which, unlike Torrent9 suggests, has nothing to do with the torrent site. In fact, Trust.zone is not happy with the unwanted promotion, labeling it as misleading. “We got major damage from this action because users now think that Trust.Zone is connected to Torrent9, which is definitely NOT TRUE,” a Trust.Zone representative informed us. 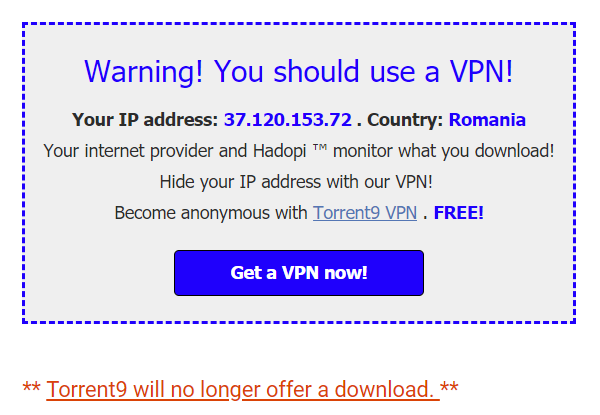 “The actions of Torrent9 are misleading. We have already sent a request via their contact form to remove the Trust.Zone warning message immediately,” the company adds. Over the past few days, Trust.Zone received a lot of complaints and requests for refunds. The company informs us that it had to hire additional personnel to deal with the sudden surge. Initially, the company couldn’t figure out what was going on. The VPN doesn’t use any tracking tools, so it was hard to identify the source of the traffic. The company eventually figured out that Torrent9 is a member of its affiliate program at trustaffs.com, among 120,000 others. Trust.Zone hoped that the situation will soon be resolved, and considering the recent removal of the ad today, this may indeed be the case. 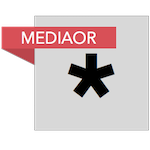 TorrentFreak also reached out to the operator of Torrent9 to hear his side of the story, but we have yet to receive a response. For now, it remains unclear why the download links initially disappeared and if they will come back now the message changed to “maintenance”. In theory, it’s possible that Torrent9 was hacked or otherwise compromised, or perhaps there was a legal threat that motivated the site’s owner to take this action.